Graveside services were held at 10:30 a.m. Saturday, March 10, at Twin Oaks Memorial Park for Velma A. Webb of Alamogordo. Webb, 100, passed away Thursday, March 8, 2018, at Gerald Champion Ray Medical Center in Alamogordo. Jay Francis officiated the services. Pallbearers were her family. Velma was born April 16, 1917, in Wetumka, Okla., to Jesse and Josie (Davis) Wallace. On Aug. 10, 1932, she married Harlin Grover Webb in Wetumka. She was a longtime Artesia resident before moving to Alamogordo. 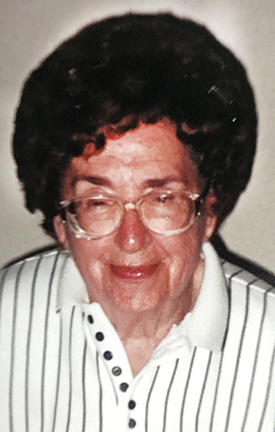 Velma was a retailer and member of First Baptist Church of Artesia. She collected antiques and had a passion for attending garage sales looking for those. Her love was her grandchildren and family, and cooking and tending to them. Velma lived life to its fullest. Survivors include grandchildren Owen Meinke and wife Debbie of Artesia, John Meinke and wife Colleen of Midland, Texas, and Michelle Brown and husband Marlin of Clovis; great-grandchildren Ian and Ty Meinke, Bonnie Meinke, Piper Goodnight, and Hunter and Halle Brown; and four great-great-grandchildren. She was preceded in death by her husband, Harlin Webb, in 1983; her parents; and daughter Patti Rue Meinke. Arrangements were under the direction of Terpening & Son Mortuary. Condolences may be expressed online at www.artesiafunerals.com.